Stitches and Scissors: Celebrating my new look. I finally got around to updating my blog look and button so to celebrate it I thought I would do a giveaway! I am loving my new look and want to share it will all of you, plus it has been far to long since I have done a giveaway. 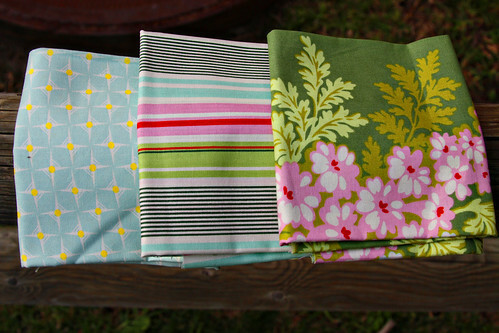 I am giving away 3 fat quarters of Nicey Jane by Heather Bailey. This line just came out and my local quilt shop has some and I am loving it. I think the stripe is my favorite. 1. Leave a comment for an entry. 2. Add my new button to your blog. Leave another comment telling me that you added the button for another entry. It is all ready on my sidebar just copy & paste it into your website. 3. Blog about this giveaway to receive another entry. I will leave it open until Monday March 15th. I will announce the winner on Tuesday. Goodluck! The new blog layout looks great! Any excuse for a giveaway is fine by me too! Love the look of those fabrics, especially the blue for my boy and the flowers for me! it looks great, so crisp, bright and clean. love the font too! LOVE the new look! and the color. PS, Can't wait to see that new quilt blogged previously! I love the new look. And of course, I love that yummy fabric! Great new look and I love Heather Bailey's new fabric. Ooh, I like the new look. Very bright and springy! Love the fabric and the button! Awesome! I like the blue and the floral! Lovely giveaway:) I'm having a giveaway myself right now. I added your button to my blog...very cute button! I love these fabrics. Thanks for the chance to win! great giveaway, love your new look! I will add your button! oh! How can you go wrong with bright spools?! thank you for hosting a giveaway and thank you for the continuing inspiration. I love your new header. So bright and happy! I just found your blog not too long ago and I LOVE it! What a fabulous giveaway. I have yet to use any Heather Bailey fabric! So Pretty! Great giveaway. love the fabrics. I am a follower, and I as well having a giveaway. drop by. Awesome! Did you design it all yourself? You must have worked hard to get it looking so great! 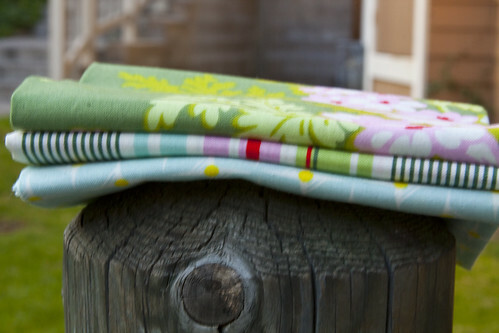 Love these fabrics and your new look! Thanks for the giveaway. Love the new layout, and the fabric's not to shabby either. Thanks for the chance to win. Your new look is wonderful! Love these fabrics you're giving away. great work on the blog, it looks super! i think that stripe might just be my favorite as well! Where's the quilt shop you go to? I'm going to make a trip to OC this weekend - I need a haircut and a visit to M&L. Your blog is looking great and love your new header and button. Just wanted to say thanks for the continued inspiration on your blog. I love your blog it is great a lot of cool stuff. the colors the blocks ect.but I don't know how to copy and past your botton it is a very pretty one I will try again , maybe I can get one of my boys to help me. welcome back, darci! seeing you back gives me hope about sewing after having a baby. our newest addition is 5 weeks old. no sewing yet for me. Beautiful fabric! Thanks for the great give-away. Love the bright colors! Thanks for the giveaway! Love that nicey Jane. Thanks for the chance. love the blog. thanks for the giveaway. Nice looking blog and nice fabric, I'd love to win. I love the logo you use on your blog. I get in the mood to go to my sewing machine and sew plus I look forward to reading the next Blog topic. Wow! Who doesn't love give-away's? Fat Quarters are my favorite!! The new blog look is pretty nifty, if I do say so myself. The spools are a nice touch ;D I see you've color coordinated them with the background and link colors, very nice! Is it still the 14th over there? I like your blog look, too! I also grabbed your button, it's now in my sidebar. And I blogged about it, although a bit late. Sorry I'm just getting caught up in my reading! i love this line, i can't wait for my fabric store to get it! congrats on the new look...it looks great! Nice fabs too! Your little spools of thread look so happy and spring time-ish. So does the Nicey Jane. Photos just don't do it justice. When I saw it in the store I really fell in love with it. Thanks for the giveaway! Beautiful fabrics!! nice new look to the blog!! love the yellow background! Yellow is my favorite color, so I love the background!